Doesn’t anybody stay in one place anymore? It would be so fine to see your face at my door. One of the hardest things (perhaps really the only hard thing) about living in Italy is that we’re so far away from our loved ones. I wouldn’t trade living in Italy for anything else, and yet… If only we could beam everyone here for the weekend! At night, when I go out on the terrace to hear the footfalls of the deer in the fields, the night birds, the rain, or look at the moon, I think of our family in the U.S., our friends, my mom. So many things I want to tell her about, but alas, I can’t. At least not in reality. I can still tell her about the music we’ve just listened to, which she would love. Or the full moon–her passion. 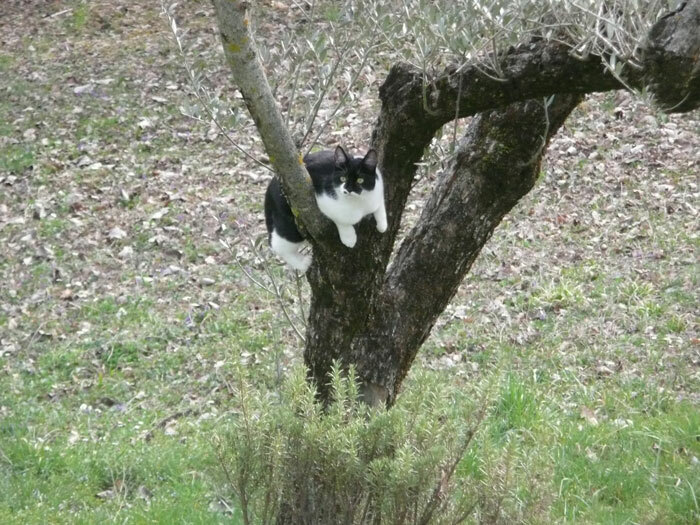 Or something our little Olinka did today, like climbing the olive tree. When one lives as an outsider in a foreign country, it takes courage to keep the spirits up, to make new friends, to keep appreciating the amazing things one has. At least we made the choice to live here. The thought of the millions of refugees around the world who have been tossed out of their homelands because of tyrannical governments, religion, slave-trade, or war…well, it’s just impossible to fathom their cruel fate. So, the moment of sadness passes, the thankfulness we feel for our lives returns, and the good memories dance in my mind. They warm the heart. They make it all worthwhile being so far away. This entry was posted in Reflections, Umbria and tagged cats, friends, gifts of life, Italian stories, living in Italy, memoirs, memories, moments, mother-daughter, Umbria. Bookmark the permalink. So true Nina – hopefully ‘beam me up Scotty’ technology will happen in our lifetime. Yes exactly Nina. I come from Australia, and I’ve had people comment to me on it being so far away. I try not to dwell on it too much, but like you I miss my family and close friends that I left behind. I love this post Nina. Though I’m reading it in reverse. I should have heeded the signs years ago perhaps. I live in Melbourne but I left my heart in Italy and there it remains. And find myself in this strange in between space. Living here but so far from the people, the culture I love most in all the world. Strange isn’t it? Ah, Janine. It’s so hard when you leave your heart in one place and have to be in another. One day you’ll be back and you and your heart will be one again! I can just feel it for you…you have too much passion for Italy to not be here. I know I’ll go back to San Miguel one day because part of my heart is still there, big-time! ~nhm.